An RPM International company, Dap Products, Inc. is headquartered in Baltimore, Maryland. They are a leading manufacturer of caulks, sealants and adhesives. Just a half an hour drive from their offices in the trendy Canton area of Baltimore, you’ll find one of the company’s two manufacturing plants. Rather striking from the highway, the complex’s six large branded silos rise from among the plant’s main buildings. They look like giant tubes of caulk. A Baltimore native, it took me to the late ’90s and working with a general contractor in San Jose, CA to discover Dap, Inc. Alex Plus (a siliconized acrylic latex caulk) was our paintable caulk of choice. And it’s funny, when I was recently asked “What is your favorite design product?” I didn’t really have a straight answer. If I was asked instead for “a favorite building product,” I’d say, yes . . . caulk. It is interesting to note that this plant sits roughly about 1/4 mile from a spot that marks the War of 1812’s Battle of North Point. And a mile or so down the road — Bethlehem Steel, a complex that looks nothing less than something straight out of a Pink Floyd video. The most impressive view of this plant is actually from a bridge about 200 feet up the highway. But no shoulder there limits photo opportunities. Dap Products, Inc. & RPM International, also responsible for such recognizable brands as Rust-Oleum & Zinsser. Not long after this post, Dap offered and we toured both this facility and their headquarters. That right up is here – Building Moxie Tours DAP Products. Exterior Wood Shutters have a long and storied history. 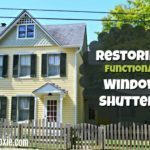 Here is the story of Refinishing and Rehanging Functional Wood Shutters on a Victorian Farmhouse. From stripping and re-applying paint, to mortising for hinges and ultimately installing hardware. Please Read On. Ha! Before I even saw your post, I posted the tweet about forgetting to puncture the caulk tube all the way and exploding the darn thing…icky mess for sure. I’m glad you pointed out the silos…would have probably missed it in my quick gaze over. Or is that glazed over? :) Have a good one! glazed over . . . har! and I did miss your tweet… I hope you got everything squared away and are having a good day! I’ll likely post your pic tomorrow. thanks Amy! Please stop taking me down memory lane with these photos that remind me of motoring down I-95 South and soaking up the mini industrialness of the area that stretches from the I-895 split to past the Harbor Tunnel. Curses to you for reminding me that despite the fact that Baltimore is more known for its crabs, it also happens to house quite a few major industrial complexes. Seriously though, thanks for the photo! Been enjoying your series this week. yep it’s pretty hard to avoid BMore’s “industrialness” from the (any) highway that passed thru. I mean — who planned that . . . and I didn’t really plan it to be pictorial tour of BMore … that’s just how it has fallen out so far. tomorrow I think a guest and pic from the southwest… and you know I always appreciated your comments John. Good one. 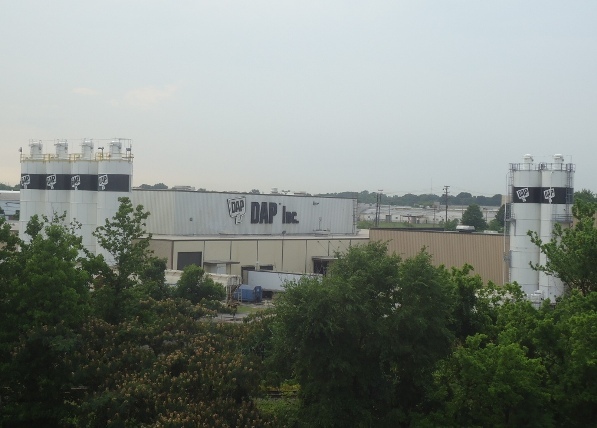 I live right here in Baltimore and did not know that the DAP factory was right there! I feel compelled to get a tour!